Day trips are ideal for groups on a budget & with limited time out of the classroom. 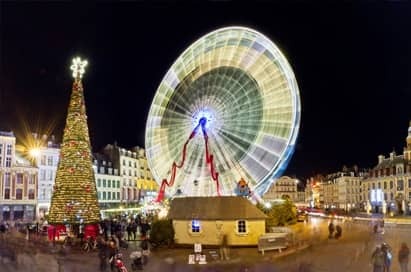 Lille plays host to the largest Christmas Market of Northern France and has a programme of celebrations throughout the festive period. Take your pupils to experience and enjoy the festivities in this lively setting. For alternative experiences, please view the rest of our school trips to France. Price shown is based on 40 paying passengers from selected departure points in December 2019 and is subject to availability. Enjoy the seasonally decorated wooden chalets which offer a variety of gifts including local handicraft in pottery, confectionery and jewellery. You may decide to take a ride on the Ferris wheel or simply relax and taste the local fayre, including chestnuts and glühwein. For groups visiting the Lille Christmas Markets, we currently offer free, fun Christmas market worksheets for students to complete. This is a great way to encourage your group members to interact with and observe their surroundings and truly get involved in the goings-on at these fantastically festive marketplaces.